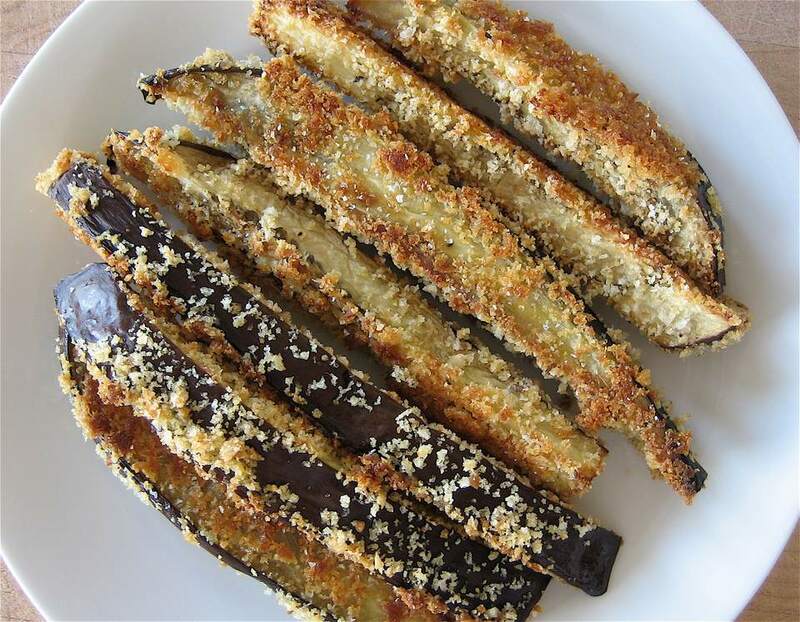 These oven-fried eggplant sticks were inspired by the deep-fried versions served at Galatoire's restaurant in New Orleans. FYI: "oven-fried" is a fancy word for "baked," if you really love crispy and don't mind frying, consider making the fried version instead. At Galatoire's these lovelies are served with powdered sugar for dipping or sprinkling. Sound odd? It may be, but it's also delicious. It's a good reminder that in earlier days vegetables of all sorts, including tomatoes, cucumbers, and peas were commonly sweetened when served. A dash or two of Tabasco sauce isn't out of order here either. In a large bowl dissolve 2 tablespoons of the salt in 1 cup warm water. Add 2 quarts (8 cups) cold water. Set aside. Meanwhile, in a medium bowl, combine the breadcrumbs, the remaining 1/2 teaspoon of salt, plus the pepper and cayenne, if you like. Add the oil and use your fingers to work the oil into the breadcrumb mixture. Transfer the mixture to a large plate or shallow bowl. Set aside. Whisk the eggs to break them up completely; seriously whisk them, you don't want any blobs of egg white in there. When you lift the whisk up it should be as lifting it out of the water. Preheat an oven to 425 F. Liberally oil a large baking sheet (or use a nonstick one). Drain and thoroughly dry the eggplant sticks by patting them with paper towels or a clean kitchen towel. Keeping one hand dry and one hand wet, dip an eggplant stick in the eggs, lift in out and shake off any excess egg, put the stick in the breadcrumb mixture and coat the eggplant stick completely, lift it out and shake off any excess bread crumbs, transfer the stick to the prepared baking sheet. Repeat with the remaining sticks. Bake the eggplant, turning once, until browned, crispy, and tender to the bite, about 30 minutes. Serve hot. You can keep them warm in a 220 F oven, but they really are best if served and eaten right away.